“I’ve always had a big interest in cars and rallycross, but until last year, I had never so much as sat in a racing car – I’d never even raced a go-kart competitively,” the 42-year-old reveals. 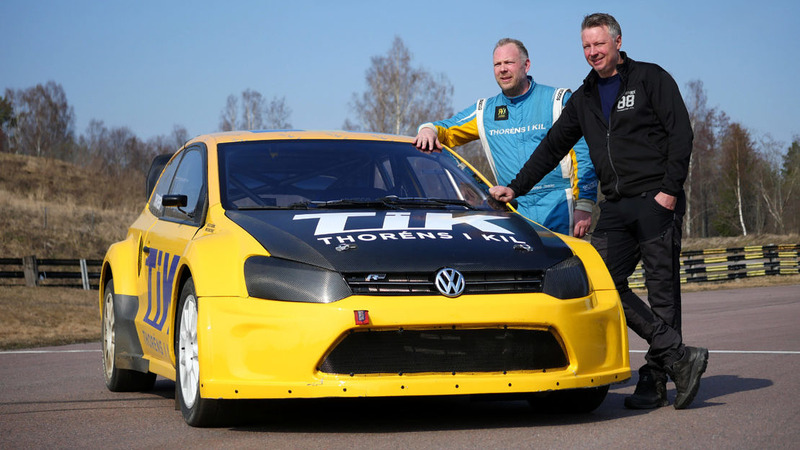 Behind the wheel of his Hedströms Motorsport VW Polo, Thorén won one of his qualifying races first time out and in round three – at Grenland in Norway – he finished on the podium following a race-long battle with countryman Andreas Carlsson. Despite a heavy crash at the semi-final stage of the last round at Tierp, the Swede concluded the season a commendable eighth in the Supercar class standings – and now, he is back for more, dovetailing his RallyX Nordic commitments with a parallel campaign in FIA Euro RX. “I have to be honest, I had a great year in 2018,” he reflected. “To finish eighth in the championship having never driven competitively before was a fantastic outcome! It’s safe to say the results far exceeded my expectations, and whilst I required a significant slice of luck to reach the podium in Norway, that definitely spurred me on. “Rallycross is like a drug – once you try it, you want more, and I always knew I wanted to come back again this year. It’s been a big job to prepare the car over the winter – we dismantled it into a thousand pieces and have refreshed it in every area – and I haven’t been able to test as much as I’d have liked due to work commitments, but still, I can’t wait for the season to start!